Need help finding clergy for your ceremony? Our free service can help you find trusted clergy in your area. If you’re thinking of having a rabbi or cantor officiate your wedding, keep in mind that most Jewish clergy observe a number of limitations and restrictions on both the location and timing of weddings they perform. The rules vary a bit from one movement of Judaism (denomination) to another, but here are some of the most common limitations. In traditional Judaism there are hardly any restrictions on where a couple can get married. A synagogue, someone’s home, a park, a non-denominational chapel or a banquet hall are all in play, as well as just about anywhere else. Some rabbis aren’t comfortable officiating in churches or sanctuaries of other religions; others are more flexible. If your ceremony is co-officiated, make sure you clear your wedding site with both officiants prior to contracting for a venue. Different religious communities have different requirements. Traditionally speaking, in Judaism weddings do not take place on the Jewish Sabbath (Shabbat). Shabbat begins at sundown every Friday and continues until a bit past sundown on Saturday (Judaism regards sundown, rather than sunrise, as the beginning of the day). Even rabbis of the more liberal Jewish movements tend to decline requests to officiate during Shabbat, though a growing number of rabbis are willing to consider it. In part because of these Shabbat restriction, Saturday nights are a popular choice for Jewish weddings. Sundays are also popular, as are other weekdays. There are a lot of Jewish holidays, major and minor, that have traditionally been off limits for celebrating weddings. The question of which holidays are available and which ones aren’t is complicated, and rabbis from different movements differ in their practice. Most important: If a Jewish clergy member says they can’t officiate your wedding because of a Jewish holiday, they’re not fibbing in order to avoid saying no for some other reason. If you’re set on your date, ask if the rabbi can refer you to a colleague who may be willing to officiate on that day. There are many ways to search for a rabbi or cantor, including word-of-mouth or even Google. 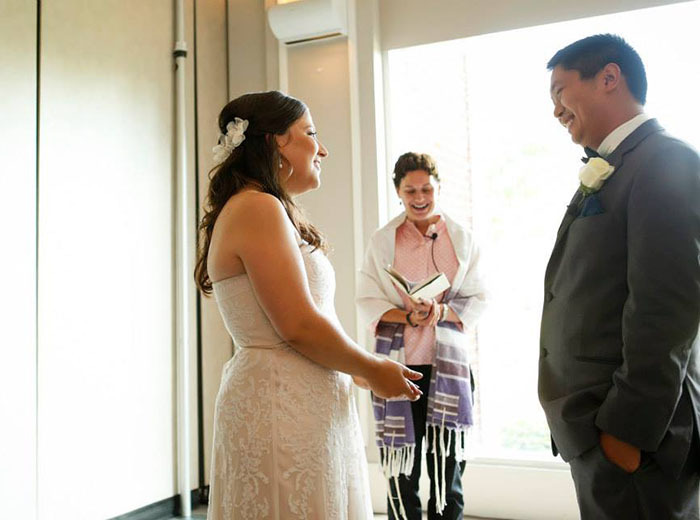 Although the percentage of Jewish clergy who officiate at interfaith weddings is growing, some couples would prefer not to start their search by asking rabbis whether or not they officiate at interfaith weddings. InterfaithFamily’s Jewish clergy referral service is a resource that can help. Just visit www.interfaithfamily.com/findarabbi and fill out the officiation request form, and we’ll email you, free of charge, a curated list of rabbis and cantors in your area who are likely to be a good fit for the type of wedding you are planning. We also refer Jewish clergy that may be willing to travel. 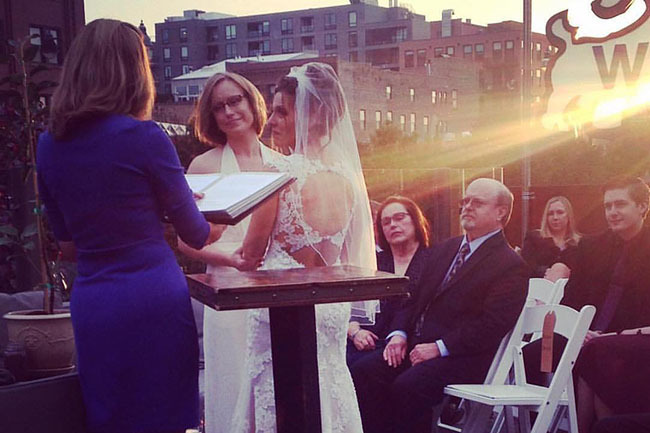 Most rabbis and cantors who officiate at interfaith weddings are not willing to co-officiate with clergy of another faith, though the number who will do so is growing. If you’re using InterfaithFamily’s clergy referral service and you’re looking for a rabbi to co-officiate, please check the appropriate box on the online form. Good clear communication is essential when working with two officiants. Many clergy (of any faith) who are willing to co-officiate may have conditions for doing so, and some will want to make case-specific decisions about what they are comfortable doing. Good communication between the officiants, and between you and both officiants, is crucial so that no one feels blindsided or misunderstood. 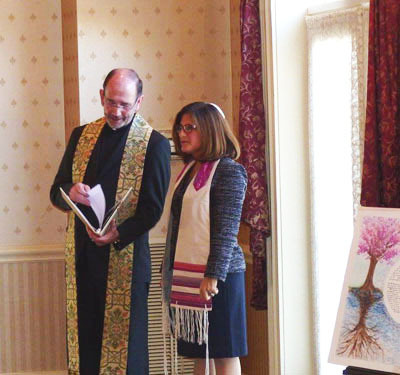 Some rabbis who co-officiate will recommend specific local clergy of other faiths with whom they enjoy working. 2. What do you charge for a fee, and when do you need to be paid? Do you use a letter of agreement? 3. How much time are you willing to spend with us and/or members of our family if there are important issues or family dynamics that require sensitivity? 4. How far are you willing to travel to a wedding venue, and what travel reimbursement might you need? 5. How would you describe your approach to working with interfaith couples? 6. Do you have ritual limitations or restrictions that we might not be aware of? 7. How much Hebrew and English can we expect in the service, and how do you work to help guests who aren’t Jewish feel included? 8. Do you do dress rehearsals? 9. Do you have references we can contact (i.e. other couples)? After your initial conversation, the most important thing is for you and your partner to decide whether or not you feel comfortable, supported and respected. You can choose to get married without having a rabbi or cantor, or any other clergy for that matter. Hiring a justice of the peace, judge or non-denominational officiant are all options. You can also arrange to have a friend deputized by the state to act as your officiant. Good communication is key when working with officiants who may be unfamiliar with the family dynamics or other issues sometimes in play in interfaith weddings. If you decide to go this route, there are many resources you can consult to incorporate Jewish ritual and cultural elements into your ceremony. See the section Sample ceremonies and definitions for wedding programs, for some good ideas. Jewish clergy fees vary greatly, though generally they fall somewhere between $500 – $1,500, depending on many variables. Fees may include travel costs, or reflect the amount of necessary pre-marital work. They also vary by region. Many rabbis and cantors offer a sliding scale if finances are an obstacle—don’t be afraid to ask for a fee reduction if this is a factor. Here’s what’s going into the fee: Rabbis bring years of seminary training into their work with couples, and often spend considerable time preparing the wedding ceremony according to the specific needs of each couple. In interfaith weddings, rabbis work with each unique couple to craft a sensitive, respectful and meaningful ceremony that strives to balance the aesthetics of Jewish ritual with the need for some cultural translation for family members and guests of other faiths. When they hire a rabbi or cantor, couples are choosing to pay for a professional to create a sacred moment that they will remember forever. It’s useful to think about the clergy fee alongside the other costs associated with weddings today. The expertise and care couples look for in a wedding cake, a DJ or a photographer all come with fees, and clergy also need to make a living. Finally, for co-officiated weddings, remember to include clergy fees for both officiants in your budget.